Toledo Scale has its origins that date back to 1897 when Allen DeVilbiss, Jr. a Toledo man, invented a spring-less scale that was unique in the day. In 1900, DeVilbiss, Jr. acquired a patent for his new scale and he established the DeVilbiss Scale Company. While the scale was a vast improvement in any other scale on the market, it would take another person to make Allen DeVilbiss, Jr's scale a household name. In 1901, Henry Theobald, having risen through the ranks at National Cash Register Company (NCR) in Dayton, had become general manager. It was in this position that Henry made a fateful decision to change one of NCRs manufacturing processes. The problem with his decision was that he didn't get approval from John Patterson, the founder of the company, and as a result, Patterson fired Theobald. Henry was just 31 years old and had acquired more than few good business skills during his time at NCR. He knew that if he could find the right product, he could make it successful. That product was Allen DeVilbiss, Jr.'s new scale. 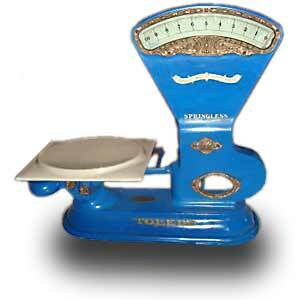 Henry Theobald setup a manufacturing facility in 1901 after acquiring the patent for the new scale. Henry hired Allen DeVilbiss Jr as the first factory manager to oversee the production of his invention. The name of the new company was Toledo Computing Scale and Cash Register Company (perhaps the name was a dig at his former employer). The following year, they changed the name of the company to Toledo Computing Scale Company, and in 1912 they again renamed the company this time to the Toledo Scale Company. "We are not obligated to make more scales, but we are morally obligated to maintain the scales that we have built. " Not only did they set up service facilities at the manufacturing plant, but they also trained men to service their scales in the field, to keep their equipment in top operating condition so necessary for the accurate measurements their customers demanded. In just 10 years, Toledo Scales dominated the market and the still young Theobald had sold more than 75,000 scales. Toledo Scales would remain in Toledo until 1975 when the headquarters were moved after the company was purchased.